recycled linerboard for both boxes and tubes! Export only. Please ask! Assorted lots of kraft liner- full truckloads, rail cars all for export. Major US mill groups. Prime and job lot. Excess mill rolls. Semi chem- 112 gsm, 126 gsm and more. Virgin semi chem medium. 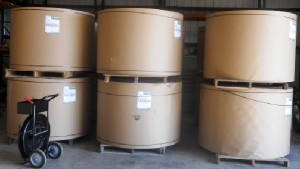 Most of the semi chem rolls go to 40" 100 cms- excellent price. White top linerboard- take advantage of excellent quality- so good it is for export only. 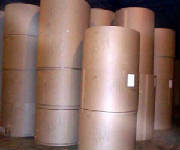 Large lots of standard widths 1 to 2 meter rolls and everything in between. Kraftliner "White Top"- We are extremely competitive with the coated white top linerboard. 140-220 gsm . This is an ongoing product and the stocklot quality is very good. Nice, uniform rolls. Major mill. Many satisifed clients. The logistics and pricing work for the most competitive markets. Export only outside North America. year 2018. Competitive export pricing. Lots are ongoing. Limited tonnage.